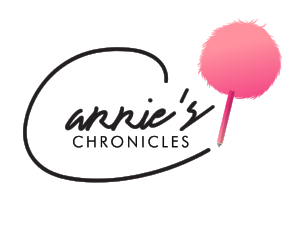 For those of you that have been following me for a very long time, “Carrie’s Cupcake Critique” may ring a bell. That’s because from age 7 to 12, I published a newsletter and had a website dedicated to reviewing the classic sweet treat in countries all around the world. 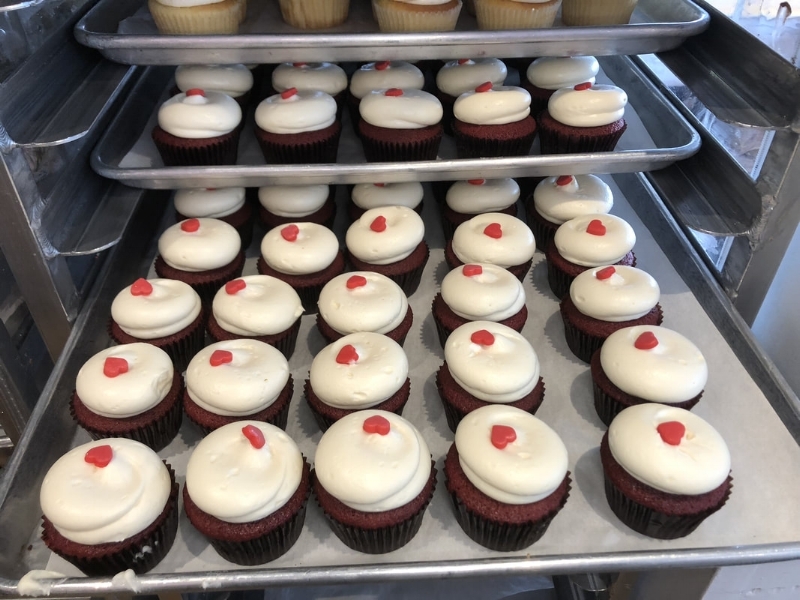 I tried crazy flavors in Rome, Paris, Hawaii, London, Canada and more, but the bakeshop that always remained at the top of my list was Georgetown Cupcake here in the US. The company was founded by sisters Katherine Kallinis Berman and Sophie Kallinis LaMontagne right around the time when my blog was first starting out in 2008. 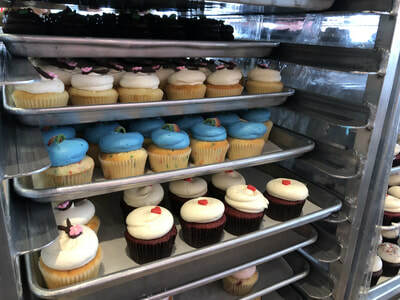 The girls left their careers in the fashion and venture capital industries in order to follow their passion for baking and opened a cupcake shop of their own in Washington, DC. Since then, they have expanded their worldwide presence by starring in their own TLC reality show “DC Cupcakes” and became best-selling authors of recipe books “The Cupcake Diaries” and “Sweet Celebrations.” They also started to ship their cupcakes nationwide and opened locations in Bethesda, New York City, Boston, Los Angeles, and Atlanta. Their SoHo shop in NYC is my go-to cupcake provider for all events and parties. 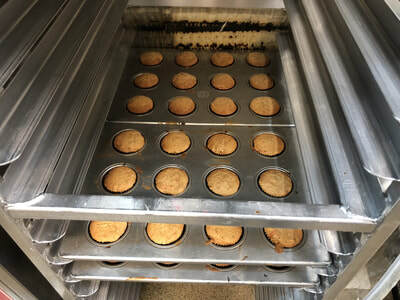 When I was eight years old, I interned at the D.C. shop for the day and got to go behind the scenes and observe the techniques that go into making their treats so delectable. Fast forward seven years later, and I got to re-visit Georgetown Cupcake in Washington for an exclusive kitchen tour. The warm, welcoming nature of the bakery, as well as their heavenly cupcake flavors, certainly have lasted all this time! Upon entering the kitchen, there was a delicious aroma that permeated the air. 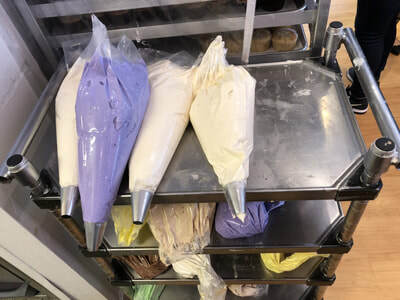 I later learned that this was the smell of dozens of Hummingbird cupcakes, fresh out of the oven. Banana, pineapple, and pecans are baked into the cake, which is then topped with the store’s “signature swirl” of vanilla cream cheese frosting, chopped pecans, and a blue fondant hummingbird. 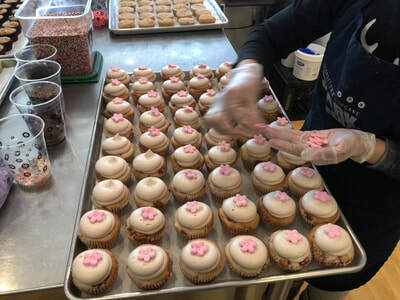 In another corner of the kitchen, a staffer was swirling cherry-infused cream cheese frosting onto Cherry Blossom cupcakes with lightning speed and mind-blowing precision. Across the table, another worker was stamping out fondant easter eggs for the Easter Egg Hunt Chocolate cupcakes, made with Valrhona chocolate and topped with "green grass" vanilla buttercream. By this point, I was absolutely drooling. 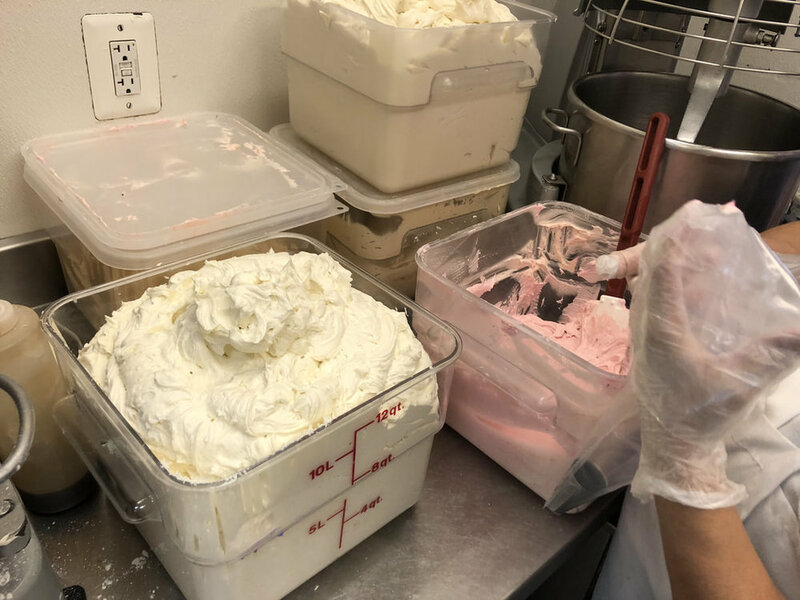 Towards the back of the kitchen, I watched as chefs cracked eggs, mixed a variety of frosting flavors in numerous large bowls, and set cupcakes on racks to cool. 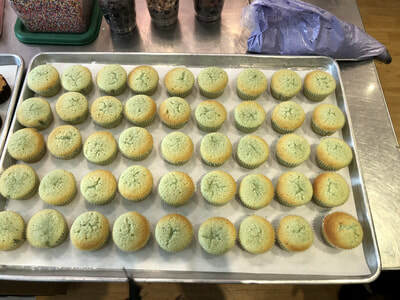 I also observed as someone pressed graham cracker crust at the bottom of each cupcake wrapper for the Cherry Cheesecake flavor, which is later topped with cherry infused frosting and a cherry blossom made out of fondant. I know, sooooo yummy. 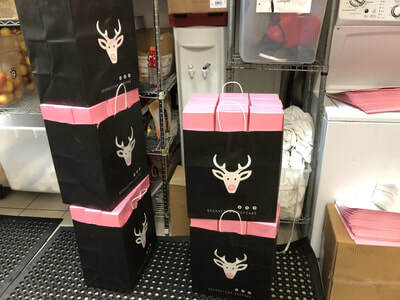 In the very back of the kitchen, there was a huge stack of hot pink boxes piled to the ceiling that are used for "to go" orders. I made sure to grab a large one full of their Easter flavors before I left. When I dropped by the store, I didn’t expect for my visit to be as nostalgic as it was. When I toured the kitchen, I was transported back to the days where I traveled the world, sampling the baking industry’s best. 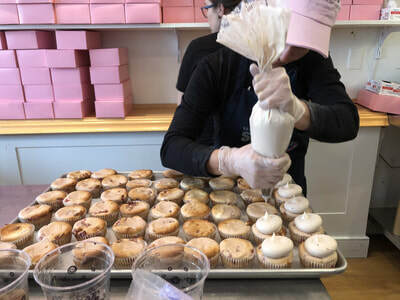 But when I bit into Georgetown Cupcake’s Cherry Blossom cupcake that day, I imagined myself time-traveling the opposite way: into the future, because a cupcake this "out-of-this-world" could only be crafted by an alien!